Story: Wim and his team have worked hard to charter the upcoming major development projects for their next product release. These projects represent the majority of the product development investment their company will make in the next 6 to 12 months. Now they have a feeling that everybody has a shared understanding of what they are investing in. The management team recognizes that they now have an excellent view on what is going to be developed. Still they find that they need a clearer view on the “why” of all these projects. They want to get a better – and measurable – view on the benefits/returns that these investments will bring. In a workshop with the product manager and the sales manager it becomes clear that despite the fact that there is agreement about the choice of individual projects, sales and product management are not aligned on the big picture. Sales is frustrated as they have the feeling that they don’t get a clear message from development – e.g. they get the message that a certain product capability is developed, and then suddenly, if they want to market the capability, development is very cautious about it; apparently the capability was not developed to the full extent, or was it? On the other hand development and product management are frustrated. They feel a lot of pressure from sales and marketing – we need this and that feature to go to this and that market – and then suddenly, when they worked hard to get the feature in, it turns out that it is not a focus (anymore?) of sales and marketing. Or, they have made a quick and dirty implementation under pressure to capture a commercial opportunity and then suddenly sales and marketing starts marketing the feature on a scale they were not ready for. Apparently a more crucial conversation needs to take place (about the big picture) before delving into the details of each specific project. When commercial units (e.g. sales and marketing) and development or delivery units (e.g. product development and service delivery) in an organization are not aligned, many things go wrong. Commercial efforts are made to market a product/service at a scale that the (development and delivery) organization is not ready for, development efforts are made without the proportional commercial support to market it. In the end all parties that are involved (and ultimately the customer) are disappointed and frustrated as the value that is created is not proportional to the investment that was made. (note: I will talk about “product” as a synonym to “product/service”). Organizations achieve alignment by linear top-down mechanisms (strategic performance management, business modeling, business cases) or iterative bottom-up mechanisms (e.g. iterative customer development). While each of these mechanisms are valuable, in isolation they give only a partial or fragmented understanding that may actually hinder alignment more than it helps. To explain this, we will need to look at the adaptive cycle metaphor as it is applied to products and services. The adaptive cycle consists of a front loop and a back loop. 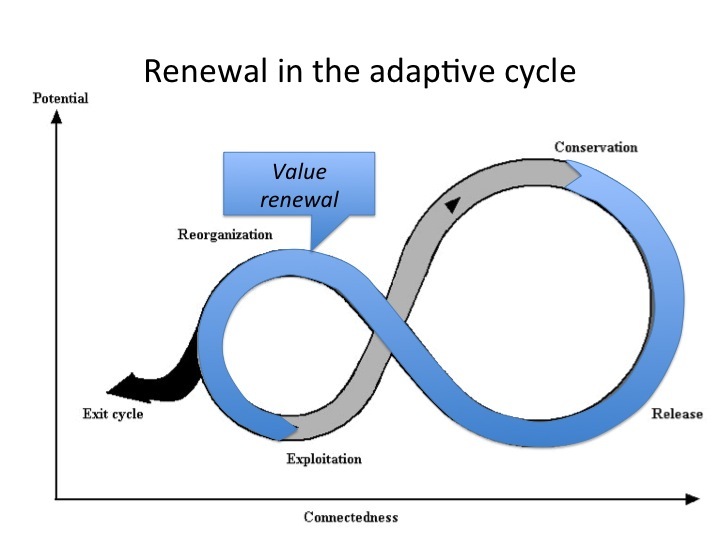 In the front loop of the adaptive cycle (exploitation to conservation, indicated in red in the figure below), an opportunity is captured and developed into a mature product within a mature market. To stay ahead of competitive pressure, the organization is continuously seeking to maximize value in the front loop. As the product and market jointly mature (in a co-evolutionary manner) product and market become very much interwoven and interconnected. Value maximization and increasing connectedness between product and market may push the product in a critical state. As the market matures, the product can become commoditized and competition may shift towards price competition. The organization may end up in the critical region where it overshoots it’s customer needs and becomes vulnerable to disruptive innovations (Ref. Clayton Christensen on Disruptive innovation). As the product grows it may become harder and harder to adapt to new needs and opportunities and ultimately the product and supporting organization may become atrophied. At the critical point the product may enter the backloop of the adaptive cycle (from release to reorganization, marked in blue in the figure above). Resources that are associated with the product are released and the organization seeks to reorganize the released resources to renew the product. It may seek to re-purpose the product to capture value from it in a novel way. Upon success, the product enters a new cycle to create new value. 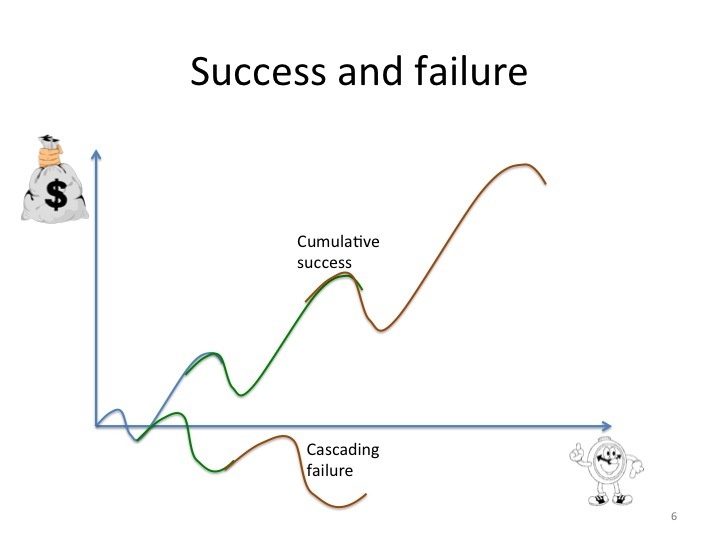 Upon failure, value is lost. 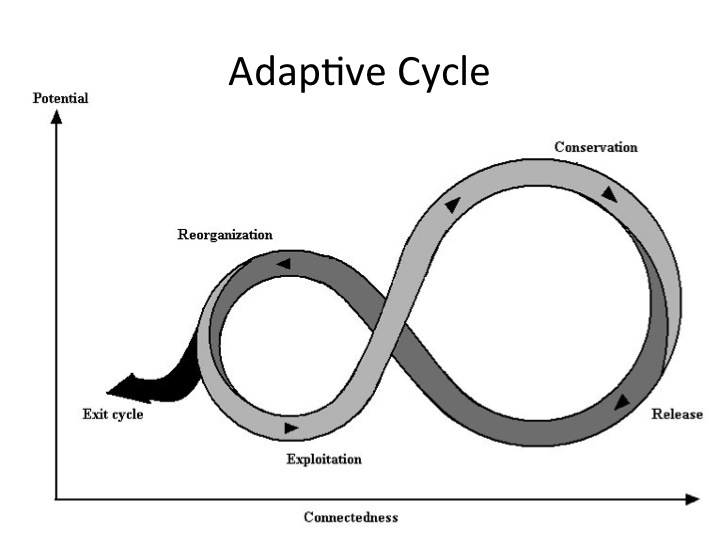 Using the adaptive cycle metaphor we take a broader view than the usual S-curve. It is exactly this broader view that is of interest to us. In practice products may go many times through the adaptive cycle at different levels of scale (product-market, product capability-market segment, feature-user group). From a value creation perspective the front loop and the back loop of the product cycle are obviously very different. In the front loop many reference points exist to understand value. The market is known and risks can be assessed. At best quantitative data is available, at least a good qualitative understanding by experts can be expected (an archetypical example of value assessment in this domain is the Alessi formula that is used by the Alessi company to assess the expected revenues of their design products; if you haven’t heard of it, just google it). The organization may need to invest to develop the necessary resources but investments can be justified based on the understanding of the value that can be expected. This is well know territory. In the back loop, value is uncertain. The main question is how to re-purpose available resources so that novel value can be extracted. Quantitative data and qualitative understanding is limited. Rather than assessing value, the organization may seek to assess the impact it is making (e.g. impact on early adopters and thought leaders). 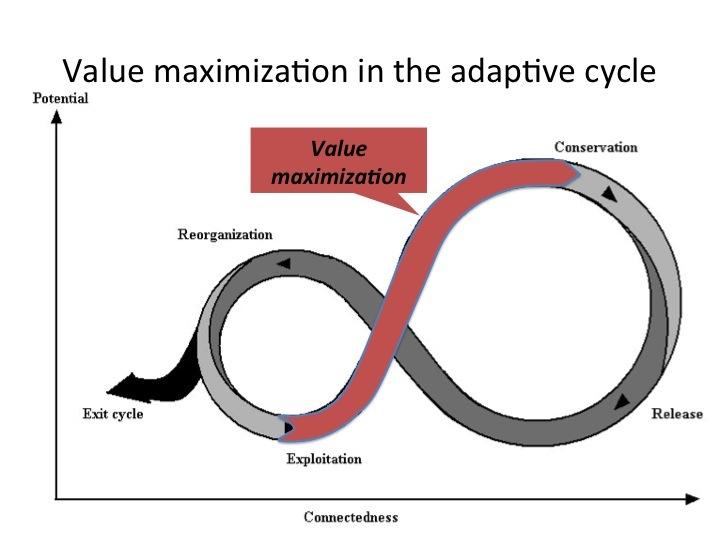 To understand value, organizations first, and foremost, need to understand where in the adaptive cycle they are operating. For a specific product – market combination the organization may be operating in the front loop; i.e. the market is an established market for standard usage of the product. For other product – market combinations, the organization may be operating in the back loop; e.g. the organization may be trying to enter a new market by using its existing product in a new way or by novel extensions to the product. Failure to differentiate between operating in the front loop and operating in the back loop, leads to the typical mismatched expectations as indicated in the introductory story. As most mature organizations are operating in both modes at the same time, an explicit understanding of where each existing or targeted product – market combination is positioned is a prerequisite to any discussion about value. Practically, the framework to distinguish between different product – market combinations needs to take into account 2 dimensions. The first dimension is value uncertainty – i.e. are we operating in the front or in the back loop? This is indicated as run-the-business versus change-the-business in the figure below. The second dimension is determined by the way we can interact with the market. 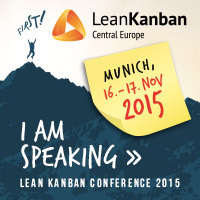 Is it possible to co-operate for example with lead customers, early adaptors in an iterative way? Or is the interaction with the market mainly linear/transactional (first develop then market). Story: Wim has organized several contextualization workshops at different levels in the organization. The outcome of the workshops is a shared understanding about the positioning of the existing and future product-market combinations in the adaptive cycle. This shared understanding is documented as four domains that represent different levels of commitment of the sales and marketing unit as well as the product management and development units. In the run-the-business domain, a clear relationship is established between sales and marketing targets (in terms of revenue and market share) and product development targets (in terms of product capabilities). 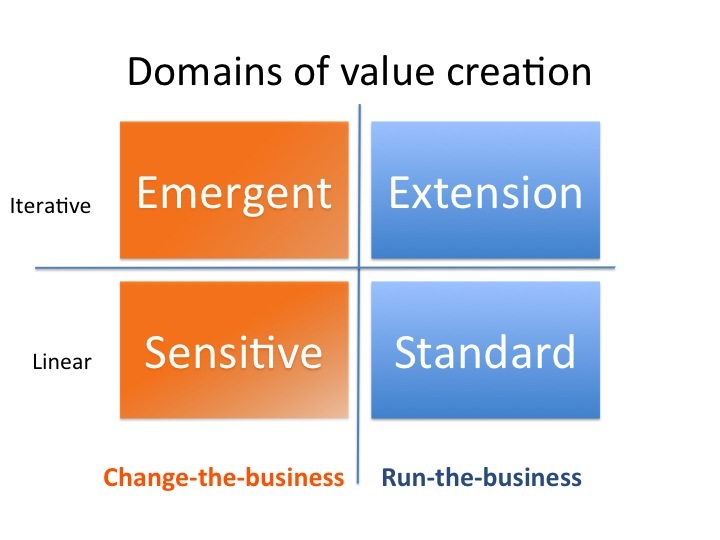 In the change-the-business domain the different units are aligned around the opportunities that they want to explore (e.g. domains in which to actively solicit and work with lead customers) and the strategic investments/riks the company is willing to take (market and product capabilities in which to pro-actively invest). This entry was posted in adaptive cycle, cynefin, value and tagged adaptive, adaptive cycle, Cynefin, lean, panarchy, value management. Bookmark the permalink. The challenge to maximize value plays both on project level as on project portfolio level. On portfolio level, the classification framework can be used to analyze if the running projects (or new proposed) within development pipeline are well aligned with the long- term strategic goals and nearer by operational targets of the company. The key question at portfolio level is weather the specific mix of projects spread over the 4 quarters of the framework allows a maximal value-return of the resources invested. Overemphasizing unconsciously for too long on projects situated in the same corner of the framework (typically generated by the external pressures) may on the longer term become the root for a business to derail from its planned growth track. Sustaining the right project mix that allows both “to pick the next season grapes” and at the same time “increase productivity and growth of the vineyard” is the main concern. On project level, not only during the definition phase the framework allows to quantify the (anticipated) fit with agreed value generation criteria, but also during its operational execution these chartered promises can be monitored at project stage milestones.